As soon as Autumn arrives, it seems to go hand in hand that at least once you will be offered a bag of apples from someone’s garden. Quite often in the past, my Mum would offer me the apples and I would say I’d love an apple crumble but I didn’t have time to prepare the apples myself. I have actually learnt that preparing and cooking the apples that we are gifted doesn’t take very long at all and is now something I look forward to being given. A bag of apples cooked down into stewed apple will keep in the freezer for up to ten months, so there is no worry of having to use it all up in one go. I like to freeze the apple in bags once it’s cooled so it doesn’t take up too much space in the freezer at all, especially if you freeze it laid out flat. You can then stack the bags on top of each other once frozen. 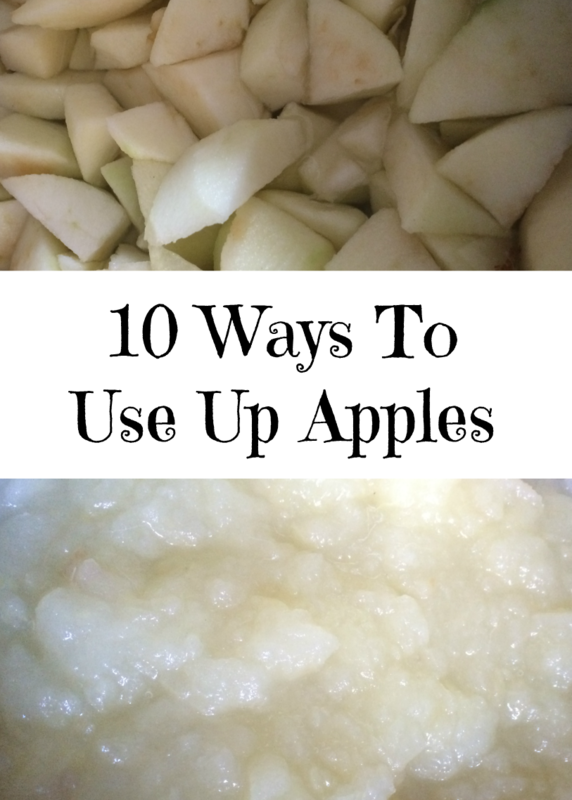 If you have access to a lot of apples during this time, inspiration can disappear after you’ve made so many apple crumbles, so I’ve come up with 10 ways to use up apples that I hope will spark your tastebuds into life. apple pie – I always have enough basic ingredients in the house to make some pastry, and you can add plenty of extras to your stewed apple such as raisins, other frozen fruit you may have in the freezer, spices such as cinnamon, nutmeg etc. If you wanted individual pies then it can be a nice idea to roll out diamond shapes of pastry and make into apple turnovers as a snack for lunches instead of making a big pie. apple crumble – there’s no doubt about it, a crumble is my favourite thing to make with stewed apple. It’s so quick and easy to make and can be put in the oven just as you take the main course out and it’s ready in time for pudding. The oven hasn’t had chance to lose any heat which helps save on energy costs too. stewed apple with yogurt – sometimes in the mornings for breakfast, I don’t want the normal toast or cereal. Yogurt won’t fill me up just by eating it alone, however by adding some stewed apple this helps fill me up and makes breakfast a little bit different. baked apples – instead of making the base of stewed apple, keep some back and core them, stuff with some butter, raisins and spices and bake in the oven for twenty minutes for a dessert with a difference. apple cake – cake always goes down well in our house, and I like to add some stewed apple to my standard sponge recipe and also layer some uncooked sliced apple to the top before cooking. Sprinkle the top with a little sugar as uncooked cooking apples can be very tart and reduce the egg by one to accommodate your stewed apple. The end result is generally a lovely moist cake. apple chutney – chutney is something that I am just starting to dabble with, and I haven’t yet made any apple based chutneys however the thought of them sound lovely, so it’s definitely an experiment I will be pursuing very soon. apple sauce for roast dinner – I don’t tend to buy jars of apple sauce as we often waste half the jar and I don’t like wasting the money. However I have discovered that if you freeze some of the stewed apple in small portions such as in an ice cube tray, you can have individual portions of apple sauce for when you need it with a roast dinner. stewed apple with porridge – with the winter months coming, porridge is a staple for breakfast with certain members of the family. Adding some apple sauce to the top of the porridge when cooked adds a lovely sweet flavour as an alternative to honey or syrup. apple jelly – jelly isn’t something I have experimented with as of yet with my apples, but I see people talking about it on the internet, so it’s one to go on my list for using up my apples. cider – well I don’t think there was ever going to be a list surrounding apples without mentioning cider was there! I have fond memories of being a child and helping my Dad make cider in the garage. It was always cold and we were using a press to get the juice out of the apples. Cider isn’t my drink of choice and it’s not something I will choose to do with my apples, but it’s a good idea if you have a glut of apples. A lot of my choices start with stewed apples, so if you’ve never stewed any apples before, how do you do it? It’s such a simple process that will only take ten minutes or so from start to finish. Peel and core the apples and roughly chop. Add to a large saucepan and sprinkle with sugar. You can be generous with the sugar as the apples are quite tart if they are fallers from the trees. You can also add more sugar after when using your stewed apple in cooking so don’t worry if you don’t add enough to start with. Add some water to the pan. I like to have the level at about half the height of where my apples are. Some people add more and strain afterwards, but I find half the height of your apples will be plenty and you don’t have to strain afterwards. Cover and bring to the boil for approx five minutes. Turn the heat off, stir and leave to cool. If you are freezing your apples, freeze when cool. What would you make with apples? Some great ideas, crumble is my favourite though!